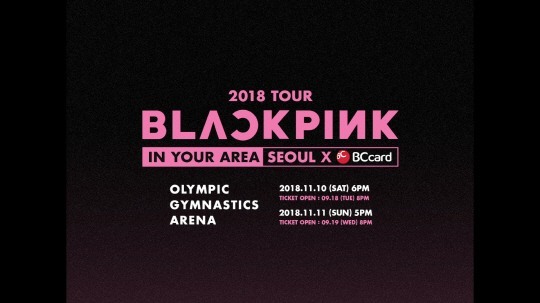 Black Pink will hold its first Seoul concerts titled “In Your Area” on Nov. 10 and 11 at Olympic Gymnastics Arena. The gig marks the first time the group will perform in the capital of South Korea, as well as the first official occasion for members of its official fan club BLINK to meet the artists. Olympic Gymnastics Arena, also known as KSPO Dome, is one of the largest indoor concert venues -- an impressive location for a group to hold its first gig. Members of the group are believed to have brainstormed ideas for their first Seoul gig, as the title for the concert was their idea. Advanced ticket sales begin for fan club members on Friday, while general sales open Tuesday.